Simple flowers are wonderful. 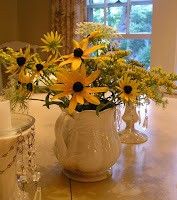 The mix of wild flowers and a vintage ironstone pot are the epitome of country decorating. My own personal decor incorporates painted furniture, ironstone and crystal. The reason why I love it is because of the casual feel it creates when blending elegant and simple. It makes me feel welcome and relaxed. I think it also makes my guest feel welcome too. Forgot the fancy or expensive flowers and look in your yard for wild flowers. Put them in a pretty short container and you have instant color.